Master the tools of design thinking using Neuroprosthetics: Principles and Applications. Developed from successfully tested material used in an undergraduate and graduate level course taught to biomedical engineering and neuroscience students, this book focuses on the use of direct neural sensing and stimulation as a therapeutic intervention for complex disorders of the brain. It covers the theory and applications behind neuroprosthetics and explores how neuroprosthetic design thinking can enhance value for users of a direct neural interface. The book explains the fundamentals of design thinking, introduces essential concepts from neuroscience and engineering illustrating the major components of neuroprosthetics, and presents practical applications. In addition to describing the approach of design thinking (based on facts about the user’s needs, desires, habits, attitudes, and experiences with neuroprosthetics), it also examines how effectively "human centered" neuroprosthetics can address people’s needs and interactions in their daily lives. 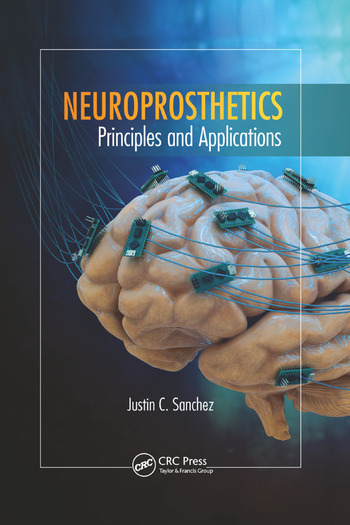 The first true primary text for undergraduate and graduate students in departments of neuroscience and bioengineering that covers the theory and applications behind this science, Neuroprosthetics: Principles and Applications provides the fundamental knowledge needed to understand how electrodes translate neural activity into signals that are useable by machines and enables readers to master the tools of design thinking and apply them to any neuroprosthetic application. Justin C. Sanchez is a neurotechnologist, neuroscientist, and neural engineer. He has served as a program manager at DARPA and before that was an associate professor of biomedical engineering and neuroscience at the University of Miami, and a faculty member of the Miami Project to Cure Paralysis. He has published more than 75 peer-reviewed papers, holds seven patents in neuroprosthetic design, and authored a book on the design of brain–machine interfaces. Dr. Sanchez’s degrees include a Doctor of Philosophy, Master of Engineering, and Bachelor of Science, all from the University of Florida, Gainesville.